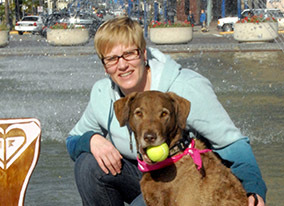 Margaret Simek’s name is well-known and widely respected among dog sports enthusiasts and professional trainers. 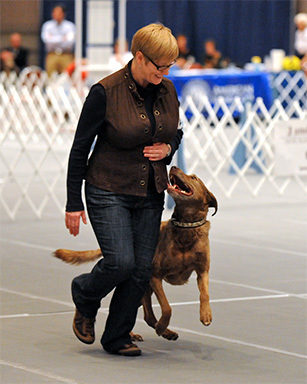 Margaret’s One Happy Dog trainer seminars and sports camps, and online classes for trainers sell out regularly, and many a trainer has Margaret to thank for their canine sports titles. Margaret has more than a few titles herself—in obedience, hunting, tracking, and Nosework. And what’s particularly impressive as you consider her list is that they’ve been achieved with non-traditional breeds, including a rescued American Staffordshire Terrier, Jack Russell Terrier, Chesapeake Bay Retriever, Brittany Spaniel, and Australian Shepherd. She’s also used only positive methods—something that for many years traditional trainers said couldn’t be done. Margaret’s passion for putting positive training methods to their most effective use infuses every private session, class, and workshop she teaches. She stresses efficiency and clarity in training, employing strategies that give the dog the most freedom of choice so that they truly learn. Margaret avoids nagging, “popping,” and scaring dogs, as these methods slow the learning process and get in the way of a well-functioning dog-and-human team. Based on these concepts, Margaret has pioneered the Simek Method of Nosework training, using operant conditioning to teach dogs to choose odor over food, and using early proofing to stay at the source for rewards. By the time dogs begin searching, they know exactly what to do. It’s a prime example of clarity of task—a foundation of Margaret’s success in both training and teaching. Training happens at both ends of the leash, and Margaret spends just as much time and passion on her teaching of humans as she does the training of dogs. Margaret isn’t just a great dog trainer herself—she knows how to make great dog trainers of others. She understands that good teaching is about starting where you are and moving forward at the right pace for you, and she takes equal joy in watching dog owners learn to turn their dogs on, in watching novice sports students get hooked, in watching trainers reach new heights of skill and achievement. As Margaret likes to say, “Excellent training produces excellent behavior.” And excellent training should be fun for dog and human alike. Whether you’re working with Margaret one-on-one on a pet dog problem, taking your first (or 10th!) Nosework class, or attending a trainer seminar or camp, you’re going to do some excellent training and have some excellent fun doing it. And her own commitment to excellence includes ongoing attendance of professional development seminars in the quest to constantly increase her own skills.